A powerful sound engine, dynamic effects, songs, lessons and so much more is crammed into the Yamaha PSR-E363 Portable Keyboard. This powerful little instrument is the ideal keyboard for newer players of all ages that want a keyboard to help them build their skill and to have some fun along the way. The PSR-E363 has a built-in 61-note touch sensitive keyboard that allows you to play expressively. This is ideal when performing pieces with any of the 500+ high-quality voices that cover everything from grand piano, organ, ensemble, synth and much more. Yamaha has even incorporated some of their trademark Sweet! and Cool! sounds into the PSR-E363 but are often found on much higher spec models. Along with the huge range of voices are 165 auto accompaniment styles that can be controlled by a single touch of the function keys to give you dynamic intro's, fills and endings. Just like the voices these styles cover a vast range of genre's so you'll be spoilt for choice for putting backing to that new song you've learnt. The PSR-E363 Portable Keyboard comes with Yamaha's own "Keys to Success" lesson functionality built in. These lessons are designed to train your timing, dynamics, note familiarity and more so that with time your playing can be dramatically improved. There's also online access to Yamaha's songbook so that you have the sheet music for the built-in songs. The keyboard can also be split into "duo" mode so that a student and teacher can sit side-by-side for lessons and use the same playing range. The PSR-E363 has an Aux input which means you can connect your smart device, MP3 player and more to play the music through the PSR-E363's internal speakers. This is great for when you want to jam along with your favourite songs. There is even a melody suppressor built in so the volume of the main melody will be lowered for you to play over the top. USB connectivity means you can also hook the PSR-E363 up to your Mac or PC for using it with your favourite music production software to create complex music. Other connections include a sustain pedal and a headphone output for when silent practice is required. 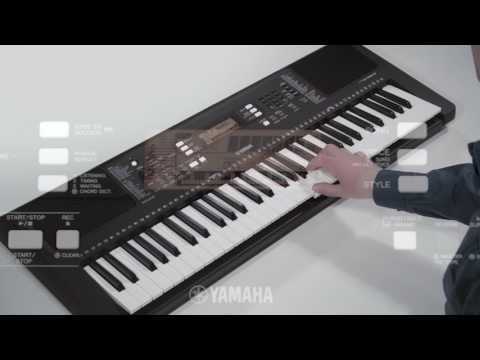 Yamaha has years of quality keyboard production under their belts and the PSR-E363 is another great example of why so many people - beginner and professional - choose this superb brand. Posted on 02/12/2018 by mickygh Play now for my own pleasure. Does the job without breaking the bank.